Maurizio Sarri praised an improved Chelsea performance in their Europa League win at Malmo but warned them to cut out defensive mistakes. Chelsea triumphed 2-1 at Swedbank Stadion on Thursday thanks to goals either side of half-time from Ross Barkley and Olivier Giroud, but a late Anders Christiansen strike gave Uwe Rosler's men hope ahead of next week's return leg. 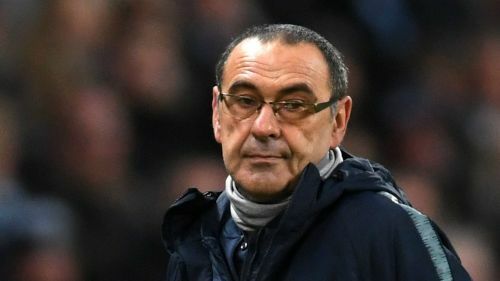 Sarri's charges had lost four away games in a row in all competitions, culminating in Sunday's 6-0 hammering at Manchester City, failing to score during that run. And their defensive weaknesses were again on show against Malmo with a poor pass from Mateo Kovacic, deputising at the back of midfield after Jorginho was substituted, leading to the counter from which Christiansen scored. Overall Sarri was satisfied with how the Blues responded from their City humiliation but he accepted that much work still remains to be done. "I am happy because we played with a very good level of confidence," said the Chelsea boss. "It wasn't really very easy after the last match, but we were confident because we moved the ball also inside our box. I think we played very well. "We risked [conceding] only on set-pieces, because they are more physical than us. We could have scored more, I think, but we conceded a goal from a mistake. "The level of application and attention was good. We made a mistake, Mateo's mistake, so it could have been better. "Better because we had three or four goal opportunities when it was 2-0, so we could have killed the match. "But I am happy with the confidence. It wasn't easy to play with this confidence after the last match. "If we concede a goal like this to a team like Manchester City or United or Tottenham, then you risk conceding three goals in 10 minutes. "We have to do better, I think. But I think that the performance was a good performance." Next for Chelsea is Monday's home game against Manchester United in the fifth round of the FA Cup, with Sarri demanding his side back up their Malmo display with further improvements in their use of the ball. "I think that we need to move the ball forward back, forward back," he said. "In this match we moved the ball too much horizontal, so we need to move it more forward and back, forward and back. "But in the last period we've had the problem of up and down, up and down. 4-0, 5-0 to us, 6-0... so we need to have continuity and consistency, I think in the mental condition to be able to approach every match with the same level of application, determination and attention. "You know very well that, if you are in bad mental condition in England, in 10 days you can lose three or four very important matches. We need consistency. We have to approach every match in the same way. It's not easy, but we have to try."